Today we're joined by Julie Belfield, author of the paranormal Holloway Pack series! 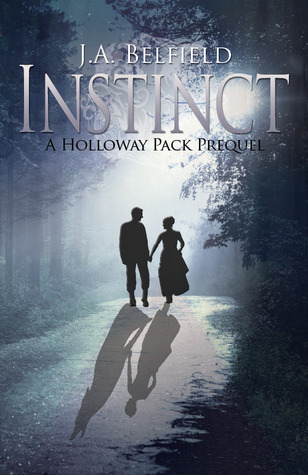 Instinct (Holloway Pack #0) was published on January 1st by J.Taylor Publishing and we're going to have a guest post by Julie, followed by a giveaway of an e-copy of Instinct! In this prequel to Darkness & Light, we are taken back in time, to the very beginning of Jem and Sean’s love-across-the-centuries relationship. Where do your ideas come from? I get asked that a lot. My answer is pretty much always the same: um … my head. How do you pick your characters? This one is just as easy to answer but there’s no denying there are underlying complications confusing the response. Because I don’t pick my characters. My characters pick me. That never used to be the case when I first started writing. One day, I decided I wanted to write a novel. So I sat and decided how my main character would look. Then I gave her a name. And took about 15 minutes to ‘make up’ a male for her, along with an extended supporting cast of four. Ta-da! Simples! On first pass through, my made-to-order characters lacked what I like to call the 3-D effect. They lacked definition. Their static quality prevented them leaping from the page. Of course, I didn’t realise this. Not until I (mentally) met Sean Holloway—the leading man of my novella Instinct: A Holloway Pack Prequel. Although Jem Stonehouse led the story of Darkness & Light (which was the first tale I wrote in The Holloway Pack Stories), it was most definitely Sean who spoke to me and told me their tale. I was working one of my (pretty flat) made-to-order novels when Sean Holloway began whispering his sweet nothing’s in my ear. Obviously, I ignored him—I was busy, dammit. Apparently, he didn’t appreciate being ignored. His whispers turned to virtual taps on the shoulder … flashes of scene after scene in my mind … and at the point I decided I’d better listen to him, he’d begun yelling out his name in my sleep, on my supermarket trips, whilst I was driving the car … to the point I had no choice but to listen. I had to admit, I liked his style of attention seeking, though. So much so that I ended up incorporating it into his and Jem’s story … and got him to bug the heck out of her instead with his name invading her mind. And the basis for Darkness & Light and how Jem & Sean should meet and know (of) each other was born. Any who have read Darkness & Light will know Sean and Jem have a history. The history was always slightly fuzzy in my mind when I first began writing their tale. Everything but the vision of how they met. Because I always knew it happened in a market place, eyes meeting across stalls piled high with wares. At the time, I had no idea whose story it was to be told. After all, I’m pretty sure Sean believed Darkness & Light to be his tale—only my stubbornness to let him have everything his own way prevented me from giving him that much as well. But I’m getting pretty good at letting ideas stew until the flavours enhance and how much seasoning is required becomes clearer. I did this with Instinct. And the more I let it simmer, the more I understood this one was Sean’s tale to tell. I also realised, I think, that it could be a whole lot more fun from Sean’s perspective—a chance to show the reader just how much of a ‘guy’ he can be. So Sean Holloway brings you my first story told from a male’s POV: Instinct. Does this mean he got his own way after all? Enter to win an e-book copy of Instinct! Vampires for me! Although werewolves are interesting characters as well. Vampires. This was such a had decision. Then I thought about Eric Northman and my decision was made. Thank you for the giveaway. I love both! But I like vamps a tiny bit more! I have to say Werewolves only cuz wolves are so cute :D Thank you so much for the giveaway! Looks great!